Pickle Ball is played on a badminton-size court with the net about the height of a tennis net. We play singles or doubles, depending on the number of people who come. Each person uses a paddle a bit bigger than a ping pong paddle and a wiffle ball. The rules are similar to ping pong. It’s not a strenuous game and we’re there mostly for the fun. Please wear safety glasses when playing pickle ball. If you do not wear glasses, please consider purchasing a pair of safety glasses. They are available through local sports shops. Your eyesight is very important! Just a reminder that Tuesday drop-in Pickleball at Commonwealth Place returns to 1:30 – 3:30 pm., starting next week. 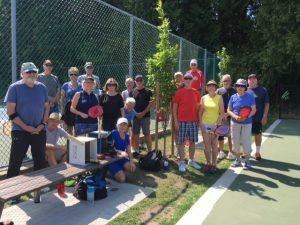 Also, Saanich has approved our block booking request for outdoor Pickleball at McMinn Park on Thursdays from 1:30 – 3:30 pm., starting April 1st. Unfortunately, Saanich was unable to approve our block booking request for Mondays due to the high demand by other groups. We are still welcome to go on Mondays and play with others who show up, remembering there is a 30 minute limit for exclusive use of a court. There is new space for people to play Pickleball on Tuesday and Friday afternoons at the Cordova Bay Community Club for $5 per session. If you are interested in Cordova Bay Community Centre pickleball, please get in touch with David Niven at <pbatcbcc@gmail.com>.